Saints secondary will continue to get shredded all season long. The Saints secondary and defense in general is dreadful, and has been for the past few seasons. Derek Carr threw for 319 yards against them in week 1, which included six plays to Amari Cooper and Michael Crabtree that went for 20+ yards. Cincinnati gave a total of 14 rushing attempts to Jeremy Hill and Giovani Bernard against the Jets, for a total of 56 yards. The Jets defense for years has been known to shut down running games and it will only be better at doing that this year. Their secondary is not as strong as it once was, including Darrelle Revis, who is out of shape and on the wrong side of 30. Teams will throw a ton against the Jets and avoid running when possible. As long as Case Keenum is the Rams QB, the Rams offense will be awful. Defenses will stack the box to make sure Todd Gurley can't hurt them, forcing Keenum to throw it. Keenum completed less than 50% of his passes against San Francisco for just 130 yards and two interceptions. Ten QBs threw for 300+ yards in week 1 of the NFL season. This is a passing league, and the league does everything possible to protect quarterbacks and impossible for a defender to play physical defense. Expect a record breaking number of yards to be thrown through the air in 2016. Remember when extra points were automatic and not worth watching? Well those days are over. This is the first change that the NFL has made to make the game better. In week 1, four kickers missed an extra point, including Nick Folk of the Jets. Why is it important to mention Folk? 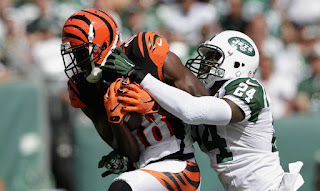 Well, the Jets lost by a single point against the Bengals, so Folk is really to blame.